Fancy a stroll along the beach at sunset, exploring the marshlands or biking along the Eastern Trail? The Kennebunks are walking, running and bike friendly and you don’t have to go far to find someplace to get out and stretch your legs. If you want some sightseeing (and shopping) with your walk, we recommend Ocean Avenue. It’s a beautiful, easy stroll along the river and is all paved sidewalk. With this walk, you can make your trip as long or as short as you want to. We recommend this one to our early morning runners. It’s perfect for getting that jog in before breakfast at the Inn! 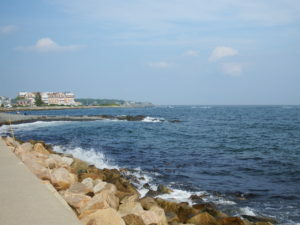 Either of the two beaches in the area offer a good opportunity to get out and feel the ocean breeze in your face. Goose Rocks in Kennebunkport is a 15 minute drive from the our Bed and Breakfast, but the three miles of sandy beach make the journey worthwhile. Gooch’s in Kennebunk is only a five minute drive from the Inn (or 45 minute walk!). When the tide’s out, you can walk on the beach. There’s also sidewalk for high tide or when you want to make your way down to Middle and Mother’s Beaches. For the serious bike rider/walker/runner, the Eastern Trail is a 65-mile section of the East Coast Greenway (runs from Florida to Maine) that stretches from Kittery to South Portland here in the Southern Maine section. There are two places to get onto the trail that are a short distance from the Inn. One is in Arundel off Limerick Rd. The other is by the Kennebunk Elementary School off Alewive Rd. This path is quite wide and accommodates walkers, biking and runners. It is also dog friendly. Wells Reserve at Laudholm Farm is a fabulous seven miles of trails that range from easy to moderate and offer a good look at coastal Maine’s diverse eco-system. Follow the Salt Marsh Loop and see where fresh water mixes with salt water from the Gulf of Maine. You can walk the length of Laudholm Beach and view the barrier beaches that protect the mud flats that are home to many seabirds and shellfish. You can also follow the Forest Trail and explore the vegetation of the area. Wells Reserve is open year around and several of their trails are suitable for cross country skiing or snowshoeing. One of our favorite walks is the Bridal Path in Kennebunk. This short two mile walk parallels the Mousam River and is suitable for all. Perfect for a sunny afternoon stroll when you want to stretch your legs and enjoy a peaceful interlude with nature. If you want a little more challenge, Wonderbrook Park in Kennebunk is a series of muddy and hilly interconnected trails that are short but fun as well. You can access them at 16 Plummer Lane off Summer Street (where the mansions are in Kennebunk!). The Kennebunkport Conservation Trust overseas 2,000 acres of land and 15 miles of trails in Kennebunkport including the Goat Island Lighthouse, Ganny’s Garden at the Village Green on Ocean Avenue and Goose Rocks Beach. The Emmons Preserve is their headquarters on Gravelly Brook Road, about a 5 minute drive from the Inn. The trail system here features a number of shorter trails (.5 to 1.5 miles in length) providing views of Batson River and old Emmons Cemetary. Many of their trails are suitable for snowshoeing and cross country skiing too. If you’d like to explore more of the Kennebunks by foot or bike on your next visit, throw your walking shoes in the suitcase. We’ll get you out on the trails!